Filed to: the art of the deal?Filed to: the art of the deal? On Thursday morning, President Donald Trump tweeted a message to immigrants protected by Deferred Action for Childhood Arrivals (DACA), telling them they “have nothing to worry about” because there will be no action until the program expires in six months. Bizarrely, the tweet was reportedly sent at the behest of House Minority Leader Nancy Pelosi. The tweet referenced the Trump administration’s announcement this week that it is ending the DACA program that covers nearly 800,000 young immigrants who came to the US as children. The administration has stopped accepting applications and will not renew permits. On Twitter, however, Trump has encouraged Congress to create legislation that addresses those who would have been protected by DACA. Moments after Trump posted the tweet meant to comfort those immigrants who are currently in legal limbo, reporters tweeted that Trump coordinated with Pelosi on the message. The president reportedly spoke on the phone with Pelosi, who suggested he tweet to those concerned about their DACA status. Other reporters soon confirmed that Pelosi told her colleagues this morning that she spoke with Trump and asked him to tweet the message. White House Press Secretary Sarah Huckabee Sanders told reporters that Trump also had conversations this morning with Senate Minority Leader Chuck Schumer, Senate Majority Leader Mitch McConnell, and House Speaker Paul Ryan. The president’s coordination with a leading Democrat comes just a day after he shocked Republican representatives by siding with Schumer and Pelosi by agreeing to a short-term debt limit extension, which was opposed by House Republicans. 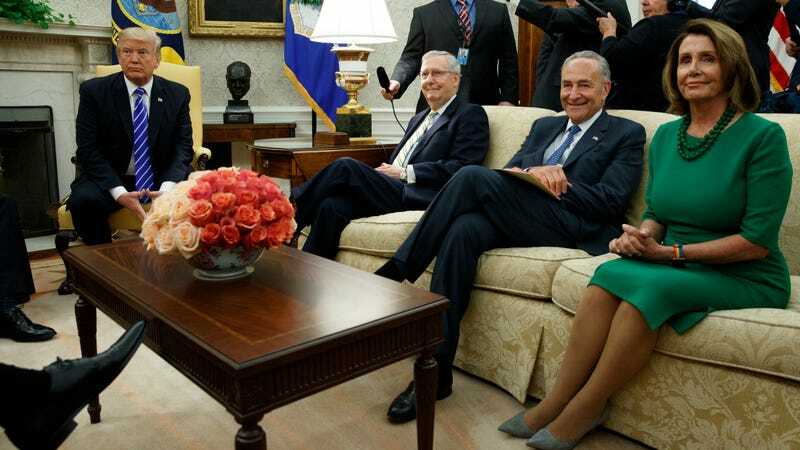 Soon after Trump’s decision to side with Democratic leaders, a photo of the president getting chummy with Schumer went viral. Considering Trump has previously attacked Pelosi and “Cryin’ Chuck,” this has left many pundits and politicos wondering if Trump is caving or just practicing the “art of the deal.” Whatever the president’s intention, it now seems that Trump’s enormous Twitter platform isn’t just a tool to be fought over by his Republican handlers, but one that can be influenced by Democrats as well.